ABBA MANIA formed in 1999 and the show has been selling out theatres and concert halls internationally ever since. This show has toured the world in its quest to bring the music of the Swedish supergroup to their millions of fans, old and new! ABBA MANIA has previously grossed over Aus $1 million at the box office in Sydney, Australia. The show has ventured to France, Denmark, Belgium, Spain, South Africa, New Zealand, Singapore, Australia and South Korea as well as touring the UK extensively. ABBA MANIA are currently touring the USA for the 8th time with 30 shows over 6 weeks. It’s a very exciting time for all things ABBA as there is talk of an ABBA reunion concert in 2018 and a sequel to the hit movie "Mamma Mia." 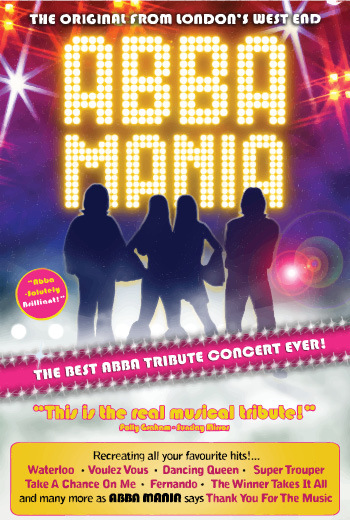 ABBA MANIA gives you exactly what you are looking for: two hours of uplifting, dance inducing and sometimes heart-breaking songs, fully live with fantastic staging, lighting and effects. The show recreates ABBA’s sound not only perfectly, but respectfully too. ABBA MANIA is not only for life long, die hard ABBA fans but the new generation of fans, who never had the opportunity to see ‘ABBA’ live. Hits include: "Dancing Queen," "Waterloo," "Mamma Mia," "The Winner Takes it All," "Super Trouper," "Fernando," "Take a Chance On Me," and many more.